Remember the Cupra? Meet the Cupster! 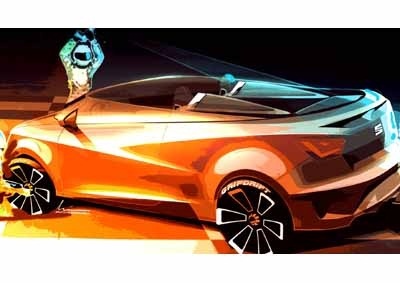 Automaker Seat will present an exciting design study at the 2014 Wörthersee Treffen later this month (May 28-31 2014) - the Ibiza Cupster - to celebrate the 30th anniversary of the iconic Seat Ibiza. This innovative design study, created and built by Seat Design, is based on the series production Ibiza Cupra with its 135kW TSI engine and dual-clutch transmission. However, in Cupster form, the concept is lower and wider than its racy predecessor. The two-seater car has no roof; thewindscreen has been replaced by a wraparound strip window and the seating position is 80mm lower than the production car. Jürgen Stackmann, president of Seat, explained: “The Ibiza has always been the heart of Seat – a young, dynamic car with an emotional design, a good head for the practical things in life and excellent value for money. "Every Ibiza captures the imagination," Seat says, "with a design as emotional as it is dynamic – and cited by customers as one of the most important reasons for buying the Spanish brand’s most successful model. Seat Design has created a surprising re-interpretation of this design language in the Ibiza Cupster." EDITOR: The Seat Cupra sold, briefly, in South Africa from 2006 to 2008under the VW flag. The brand's sudden disappearance caused much anger among buyers and Seat fans. The steering wheel is swathed in leather and the paintwork is a custom New Orange hue, with a dark grey cover behind the classic 'double-bubble' seats. The cabin, Seat says has a traditional racing feel, the design lead being taken from the Ibiza Trophy race car. "With minimalist instrument dials, black Alcantara upholstery and low-slung bucket seats, the Ibiza Cupster has a definite racing feel." There is also no shortage of performance: the Cupster is based on the Ibiza Cupra and that means 135kW from the 1.4 TSI engine, super-fast gear changes thanks to the DSG transmission and precision sports running gear with 18" wheels."